Day Two of Groopshop 2016 commenced with Alan Noel waxing ecstatic about manipulation of color and the utilization of asphaltum in the palette of the furniture finisher. Unfortunately, I was sitting in the back exchanging emails regarding the editing of the upcoming To Make As Perfectly As Possible: Roubo On Furniture Making, so my attentions were being diverted. Also exasperating was that Windows 10 started downloading onto my laptop without my permission or request. I find myself thinking more and more about Dave Reeves’ Ipad with attached Bluetooth keyboard. The odds are exceedingly high that at least one of these units will show up here in the not too distant future. I buy expensive Windows-based laptops and still they are junk. Grrr. At the conclusion of his time Alan presented me with a remarkable gift, about which I will write more in the future. 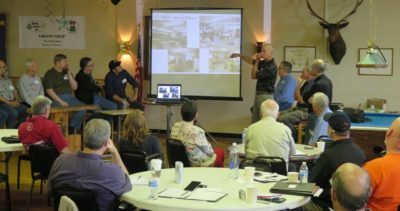 John Hurn was the ringleader for an entertaining and enlightening roundtable focusing on the infinite variety possible when it comes to how we outfit, organize, and work in our shops. John had compiled images from nearly a dozen Groopster shops, with each shop owner commenting briefly about the strategy they used for their own crib. The inestimable Greg Williams, retired from his post as Technical and Training Guru at Mowhawk since just after the War of 1812, took us to lunch time with a presentation on the skillful use of kneadable epoxy, a/k/a “tootsie rools”, as a fill material. Each participant had a sample board on which they could practice the exercise with Greg leading them through it step-by-step. 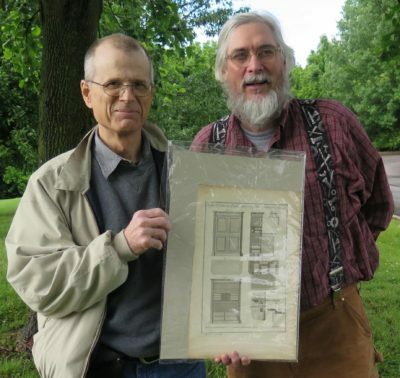 Greg remains one of Groop’s true treasures, and his willingness to share his nearly limitless knowledge and experience is a great model for the rest of us. 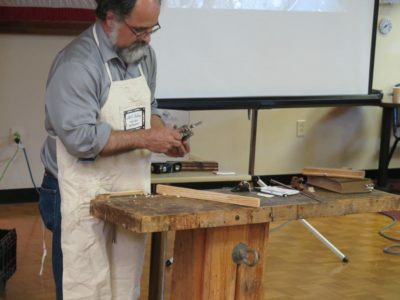 Randy Bohn showed us the tools and processes he employs when it comes to replicating small sections of moldings to replace losses that are often evident when undertaking furniture restoration and conservation. Randy even showed us some spectacular molding planes a friend of his made for him, and no I will not share the name of this fellow until I get confirmation I am on his client list. 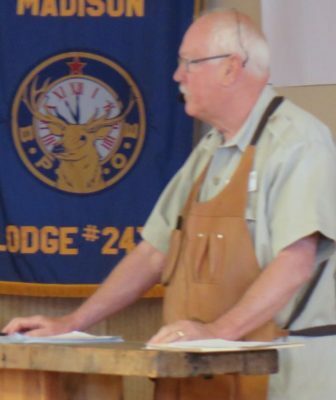 Dave Reeves closed out our sessions at the Elks Club with a rousing and heartfelt exhortation on the living of life, both inside and outside the shop. 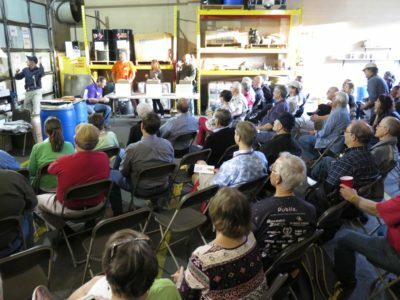 Dave has thought long and hard about seeking to live a life well-lived, and I find his ruminations both convicting and inspiring, spurring me to greater virtue personally and honed skills in the shop. With that we broke camp and headed across the street for the tour of Besway led by our host and sponsor, Mark Faulkner. He described the processes of the business in great detail, and recounted the profound strategic realignment Besway has undergone in recent months, including the first public announcement of the merging of Besway with Benco. I found this tale to be exceedingly inspirational. 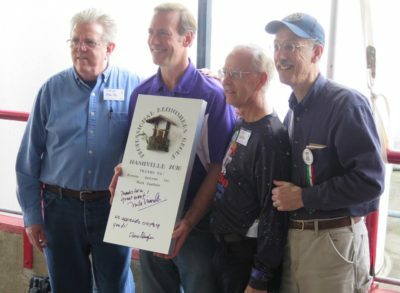 Mark was presented with a plaque from the hands of Dan Carlson commemorating the event. I know I have two similar artworks in very prominent locations in The Barn. One of the entertainment highlights of Groopshop 2016, as with most of its predecessors, was a spirited game of Finishing Jeopardy, whose outcome was not exactly according to any set of rules I could derive. 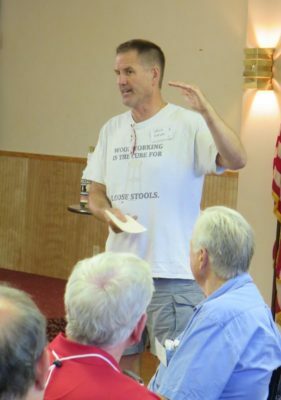 It was followed by Mike’s Mostly Honest Auction which serves as the primary fundraiser (aside from modest dues) keeping Groop running for another year. The Auction is always chock full of us buying each others’ surplus stuff, and I managed to get out the door with a bag of 6p un-hardened cut nails, two big rolls of heavy ash veneer, and a copy of the 1926 treatise The Chemistry of Natural and Synthetic Resins by T. Hedley Barry et al. I contributed my own group of lots for the auction including a set of clamps I will be writing about in Popular Woodworking, the flat of a dozen paste wax samples I prepared, and a large container of the paste wax we formulated and mixed the day before during my presentation. I also contributed an actual print from a First Edition of Roubo’s L’Art du Menuisier. Bidding was spirited and the artifact went home with John Hurn. More bout that later.